Gynecomastia, hypertrophy of the male mammary gland, is a common pathology. Gynecomastia often gives rise to psychological problems, especially if it appears during adolescence. Diseases exist that can cause excess mammary or breast growth in men. An evaluation is therefore necessary in order to rule out obesity, testicular cancer, a hormone problem or a tumour of the breast. If no cause can be identified, them the gynecomastia is called "essential" and can thus be treated by reconstructive surgery. The principles of the treatment of gynecomastia (or of adipomastia) are to reduce breast volume and potentially to treat excess skin. Scars are deemed definitive after 1 year. Problems of breast sensitivity are common and temporary. They improve between 6 months and 1 year. 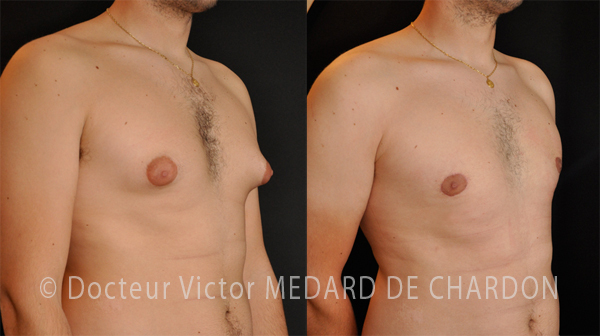 Breast surgery in a 20-year old man. Areolar reduction and resection of the mammary gland.